In 1966, the NHL announced that six expansion teams would be added as a new division for the 1967 – 1968 season, officially because of a general desire to expand the league to new markets, but just as importantly to squelch the Western Hockey League’s threat to turn into a major league. The San Francisco Seals were one such team from the WHL. The NHL awarded an expansion team to Barry Van Gerbig for the San Francisco Bay area. Van Gerbig decided to purchase the WHL club with the intent of bringing them into the NHL as an expansion team the following season. Van Gerbig had planned to have the team play in a new arena in San Francisco, but the new arena was never built. He decided to move the team across the Bay from the Cow Palace in Daly City to Oakland to play in the new Oakland–Alameda County Coliseum Arena (now known as Oracle Arena). He renamed the club the California Seals. This was done in an attempt to appeal to fans from San Francisco, and to address complaints from the other NHL teams that Oakland was not considered a major league city (notwithstanding the presence of the American Football League’s Oakland Raiders and the pending relocation of Major League Baseball’s Kansas City Athletics) and would not be a draw for fans. 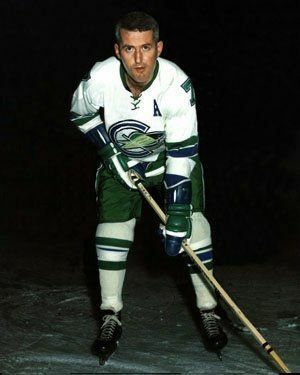 A year later Van Gerbig brought the Seals into the NHL as an expansion team and retained a portion of the club’s WHL roster such as Charlie Burns, George Swarbrick, Gerry Odrowski, Tom Thurlby, and Ron Harris. While the Bay Area was not considered a particularly lucrative hockey market, the terms of a new television agreement with CBS called for two of the expansion teams to be located in California. The California Golden Seals were a team in the National Hockey League (NHL) from 1967 to 1976. Initially named California Seals, the team was renamed Oakland Seals partway through the 1967 – 1968 season (on December 8, 1967), and then to California Golden Seals in 1970. The Seals were one of six teams added to the league as part of the 1967 NHL expansion. Based in Oakland, California, they played their home games at the Oakland–Alameda County Coliseum Arena. However, the Seals were never successful at the gate, and eventually moved to Cleveland to become the Cleveland Barons in 1976. Golden Seals – The Golden Seals were named after Northern California’s old WHL franchise based in the Bay Area, the Bay Area is a Natural habitat for Seals. The California Golden Seals were a team in the National Hockey League (NHL) from 1967 to 1976.